On September 20th, we had another fantastic Crew You Regatta and post-race raft up in the lovely Richmond Riviera. We had nine J/24 boats come out for this unique event. There are a few rules for this event – (1) the owners may not drive their boat (2) Extra points awarded for retrieving a beer from the Beer Duck Buoy and (3) at 12 knots of breeze we go down to the jib. Exceptionally exciting was that we coaxed out at least two boats that don’t regularly race with us (Phantom and Backwards) and third was chartered by the OPB-YC Commodore, Jasper van Vliet, so that he could technically still sail “OPB”. On top of that we had 15 new crew recruited to sail for this event, and could easily staffed another boat if we had one. 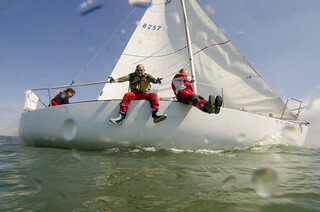 We hope to see these sailors back out racing during the midwinters because they had a great time. We were fortunate that the RYC race committee asked us to move further south than we originally wanted in order to make more room for the International 14 Nationals. It put us more into the slot than we would’ve liked, but we heard from the dinghy folks that they barely had any wind behind Angel Island all day. After 5 races, we rafted up our boats with our race committee and started up the BBQ. We will keep brainstorming to find a location that might be less rolly for next year but still deep enough for the motherships to anchor. JWorld: Thanks for letting us use your racing marks and ground tackle. Come and race with us next time. Phantom: Appreciate you guys coming all the way up from Alameda and waiting around for the first race. You would’ve won your division had you heard the OCS call and cleared it. It seemed like you were enjoying the tunes as well. Hans: great job on race committee again. Fun and organized all in one package! Sue and Bill: you guys rock, thank you for the use of your boats for both the race and the raft up. You are amazing friends. Volunteers: Dave, Annette and Andy – it was great to have you on the RC it was clear that you got the spirit of this event and were glad you had fun helping us out. Owners: thanks for letting other people drive your boat, we hope that was as good for you as it was for us! Zane: After tucking the boats away, Peter, Jasper and I were enjoying a little vino at a local bistro. I was re-capping the song list for the day when a lovely blonde at the next table looks over and says “I’m down with OPP”. Before Jasper could ask her weight, and while her date was blushing horribly, I clarified “OPB”. We got a lot of positive feedback on the race too. One said he thought it was the best regatta of the year. We’ll take that. Another said he’ll certainly crew again unless he gets his own J24 first. We’ll take that too. We’re stoked to get so much positive feedback. We’re also seriously considering either moving this regatta to Alameda next year or doing an additional one in the estuary there. Shorts, T-shirts, you get the picture. This entry was posted on Sunday, September 21st, 2014 at 7:26 pm and is filed under Regattas. You can follow any responses to this entry through the RSS 2.0 feed. You can leave a response, or trackback from your own site.